By: Kyle Hintz. Published: February 11, 2011. 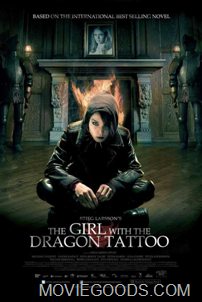 Based on the international best seller by Swedish author Stieg Larsson, The Girl with the Dragon Tattoo is a Danish film directed by Neils Arden Oplev and starring Noomi Rapace and Mikael Blomkvist. Don’t worry, I’m aware that you have no idea who these people are, I didn’t either until I saw this film. This is one of the best thrillers I’ve seen in recent times, not surprising, given the source material. The film begins as the trial of journalist Mikael Blomkvist (Michael Nyqvist) ends. He has been found guilty of libel for publishing allegations against billionaire industrialist Hans-Erik Wennestrom. He is fined and sentenced to three months in prison, but he won’t have to serve his sentence for another six months. In light of this, Blomkvist decides to step down from the board of directors of the magazine Millennium. Meanwhile, Lisbeth Salander (Noomi Rapace), a professional hacker, has accessed Blomkvist’s hard drive for a client, Dirch Frode, the lawyer and friend of Henrik Vanger, the former CEO of Vanger Enterprises. Vanger approaches Blomkvist to investigate the disappearance of his niece Harriet forty years ago on the tiny island of Hedeby. Blomkvist agrees since he’ll be paid handsomely no matter the outcome of his investigation. He makes little headway until Lisbeth, who has still been monitoring the activity on his laptop, puts a piece of the puzzle together and sends it to him in an easily traceable e-mail. The two team up to solve the case and the film takes off from there. I know this sound like all too familiar territory, but it’s handled expertly and draws upon the novel to immerse you in a very rich, real and complex world. Most of the credit for that belongs to Stieg Larsson. The director Niels Arden Oplev does a great job of not letting this become an action film, instead making the violence carry weight. Noomi Rapace gives a riveting performance as the antisocial, gothic, 24-year old hacker Lisbeth Salander. In a film full of intrigue, she’s the most interesting part. A remake of this film is already in preproduction with David Fincher at the helm and Rooney Mara (from this year’s The Social Network, also by Fincher) to play Lisbeth. While I have no doubt that will be a good film, I see little point in retreading what has already been done so well here. Either way, see this for Noomi Rapace; it would be a crime to overlook her performance.